Do you recognize this smiling face? 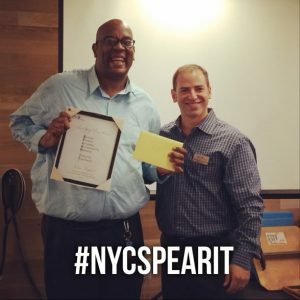 If you’ve been to our 44th Street location within the last four months, you’ll probably agree that Kevin Stafford’s got #NYCSPEARIT in spades! As a member of our care coordination team, Kevin’s job is to take the hassle out of getting back to life. From making sure that your insurance covers your treatments to helping you book appointments that fit your busy schedule, Kevin takes great pride in making sure our patients have the best possible “exSPEARience”! Kevin’s dedication to our patients has quickly made him a crowd favorite! After months of receiving notes and comments about his welcoming nature and friendliness, our management team awarded him with a SPEAR-IT award at our first full-team staff meeting of the year. Fun fact about Kevin: He’s also a singer! Kevin’s dulcet tones can be heard on a track he wrote and produced himself about our SPEAR-IT values. Congratulations, Kevin and thank you for all you do! You help SPEAR bring NYC #backtolife! To see how Kevin and SPEAR’s care coordinators were rated EXCELLENT by over 5,000 new Yorkers, check out our real-time, un-filtered, third party surveys!